James A. Creech, 94, of Knightdale, NC passed from this life surrounded by his loving wife of 73 years, Joyce Soprano Creech and family members. In his remarkable life, he raised three daughters - Jeannine Weeks (Paul) of Louisville, Tennessee, Jamie Reinsch (John) of Rock Hill, South Carolina and Jerri Buck (Glenn) of Knightdale, North Carolina. He is also survived by his four grandchildren: James Weeks (Erika) of Nashville, TN; Catherine Robson (Derek) of Billerica, MA; Justin Buck (Carrington) of Raleigh, NC and Kathleen Wilkerson of Sumter SC. He is survived by his brother, Roy Creech and was preceded in death by his siblings, Ruth, Edward, Tom, Joe and Percy. He would learn shortly before his passing that he was to become a great grandfather which would have brought him great joy. But it is not the story of his passing that I want to share with you, but rather the story of this extraordinary, yet ordinary man and his life well lived. Born to Walter and Bertha Creech of Smithfield NC on Jan. 3, 1925 he spent his youth delivering newspapers and doing whatever odd jobs he could to help his family during the depression years. While caddying for a local lawyer on an otherwise uneventful day on the 9th hole at Holt Lake Golf Course, a worker came running out and announced that Pearl Harbor had just been bombed. Without hesitation and showing his lifelong patriotism and love of country, he enlisted -- joining the Army, 26th Yankee Division and became embroiled in the European theatre. He served as an infantryman in France and Germany, earning marksmanship awards and volunteering for many special combat missions. On one of those missions, he was wounded by enemy shrapnel fire, leading to his capture. He was the only soldier to survive that mission on that Thanksgiving eve patrol. He was held as a POW in Germany for 154 days. During his days as a prisoner of war, he befriended one of his German captors, Heinz Stechow. Jim always told Heinz “the Americans are going to win this war and when we do, you tell them that you befriended me and they will treat you well”. He gave Heinz his home address on a small scrap of paper to carry with him as proof. That friendship not only survived his days of captivity, but many years after the war was over, they reconnected and Jim and Joyce went to Bremen, Germany to visit his lifelong friend who had become an accomplished artist. They remained in constant contact until Heinz’ passing. One thing you could always count on, when Jim Creech befriended you, it was for a lifetime. Mr. Creech was promoted to SSgt in November, 2007 and was the recipient of 2 Purple Hearts and 2 bronze stars. He and a new army enlistee buddy, Earl Schnabel, had met two sisters in Earl’s hometown of Allentown, PA. Dad told Earl he was going to marry Joyce and that was all there was to it…. love at first sight. 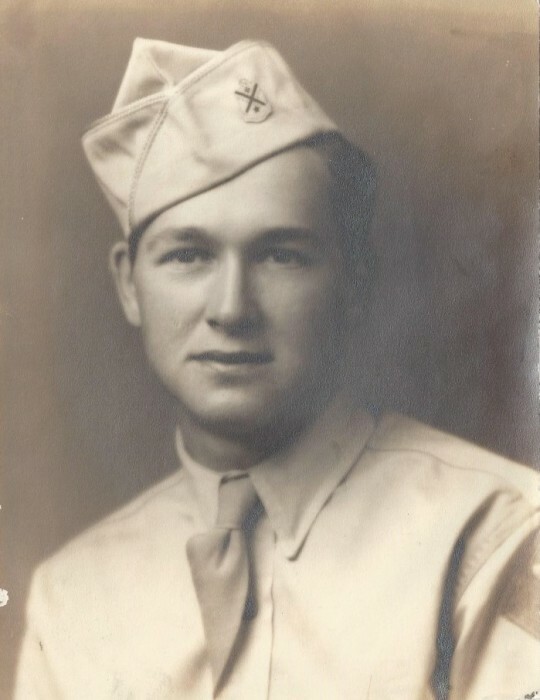 They wrote letters, telegrams, post cards, whatever they could throughout his basic training and continued as he was shipped overseas to France and Germany and many places in between. Dad’s capture left her without contact and wondering if he was even still alive when she received a telegram that he was “missing in action”, later her letters were returned “undeliverable” when she sent them to the POW camp where she was told he was being held. After Dad was liberated and returned to the states, he went straight to PA and they walked several miles to the Magistrate’s office in Allentown and were immediately married. That marriage has lasted 73 years of devotion to each other and they raised three daughters together. Dad always said that he would never be cold or go hungry again after his POW days, and always wanted everyone around him to have enough to eat. At each meal for the rest of his life, even if Mom had fixed his very favorite meal, he would always leave a little bit of food on his plate and would tell you it was ”for the prisoners”. After surviving POW camp, he returned to civilian life and began his career – appropriately enough in the grocery business. He worked with Colonial Stores, Clark’s, Piggly Wiggly, Big Star and Grand Union stores striving for better opportunities. Starting out as a meatcutter, he always gave attention to each and every customer request. He was a true “company man” and labored long hours to have the best meat case of any store around while constantly striving to keep his gross margins the highest of any store every week…it was a sense of pride and accomplishment for him… just as everything he did in life. He rose through the ranks to become department manager, district manager - transferring many times, uprooting his life and family to pursue opportunities to better their lives at other stores, other states, finally retiring as Division Meat Merchandising Manager in the Raleigh Division. Life with Dad was never dull, and afforded his children the opportunity to meet many of the colorful characters he encountered in this career – how many kids can say they met the original “Little Oscar” and rode in the original Oscar Meyer Weinermobile, or sat on the tall shoulders of Benny Reynolds, the 1961 All Around World Champion Cowboy, or Miss America 1963 and other local “beauty queens” that were invited to the new store openings throughout the years. Life with Dad was always fun and interesting and offered new adventures on a regular basis. After retirement, he put the same total commitment into his new lifestyle. He was regularly asked to speak to area school classes and assemblies about his wartime experiences. He felt this to be a strong calling for he believed that real history, especially regarding WWII, is no longer being taught in schools and that if people never learn the real truths of war, they are doomed to repeat the same mistakes. He often received many letters back from the students with poignant questions and comments that made him realize just how important it was for him to pass this knowledge along to younger generations. He was interviewed many times by print and TV reporters who wrote articles for newspapers in NC and also in Joyce’s home state of PA, and he appeared on special interest broadcast television programs. One such TV program was “Primetime”, a weekend community affairs program hosted by Ervin Hester, another lifelong friend. Ervin met Dad in the early 50’s when there were not many job opportunities for a young black man in their small town. Dad gave Ervin his first job working with him at the grocery store in Oxford. Ervin said that Dad and Mom were the first “white people” to let them eat with them at their kitchen table, something he never forgot and retold many times over during his lifetime. Ervin credited Dad with giving him opportunity and purpose, and he went on to become the first African-American newscast anchor in the Southeast for WTVD in the 1970’s and would later be inducted into the NC Association of Broadcasters Hall of Fame in 1996 — the first African-American to receive that honor. He visited with Dad at least once or twice a year throughout his life and in his later years he had his daughter bring him to visit because he was no longer able to drive himself for health reasons. He never missed a chance to tell Dad what an impact he had on his life… and remained another lifelong friend until his passing just a few months ago. Dad embraced hobbies with newfound zest since he finally had time to “actively relax” in retirement. He and Mom would walk a mile or more each day even into his late 80’s -- he would stop off at neighbor’s houses to carry the newspapers from the driveway up to the doorway, or roll the trash bins back to the house, or numerous other small but considerate gestures. He would stop and share a kind word or concern, and since they moved from the neighborhood into a retirement community, the residents still continue to ask about him and send him their best wishes. He particularly enjoyed spending time talking “war stories” with his neighbor Tim Shermer and his son Chase. Tim was instrumental in helping Dad finally receive his long overdue Army promotion to Staff Sergeant. His paperwork had been lost after his discharge and Dad had tried unsuccessfully for years to get it put through, but had given up. Tim took up the cause and on Nov. 12, 2007, Dad was finally presented with his stripes. Tim was not just another neighbor, but a lifelong friend and a Masonic brother. Dad always loved being outside so gardening was one of his greatest passions. He always strived to have the biggest, tastiest and the first juicy ripe red tomato of the season. He happily labored long hours on end even into his late 80’s, even in the hot summer weather, and amazingly, would never break a sweat. His large backyard garden was a source of personal pride for him – it was usually so prolific that he sold his excess produce to make some small spending cash, but moreover it gave him the opportunity to meet and converse with neighbors and also with perfect strangers who fast became new friends. Always a salesman, and never wanting to let anything go to waste – a trait that was engrained in him from a childhood of the depression – he would display his garden bounty of tomatoes, green beans, corn, okra, butter beans, and so much more, often have his “regulars” call him well before spring planting just to be sure they were on his “list” to let them know when a particular thing was available. Wednesday was always “FISHING DAY” and he would meet up with George Murphy at Moore’s Pond. Dad learned the fine skills of fly fishing and that is where he would spend every Wednesday after his retirement. They would plan their menus for “fishing day luncheon” each week and prepare a feast before spending the rest of the day catching crappie, bream and bass till the buckets were full and the sun was setting. 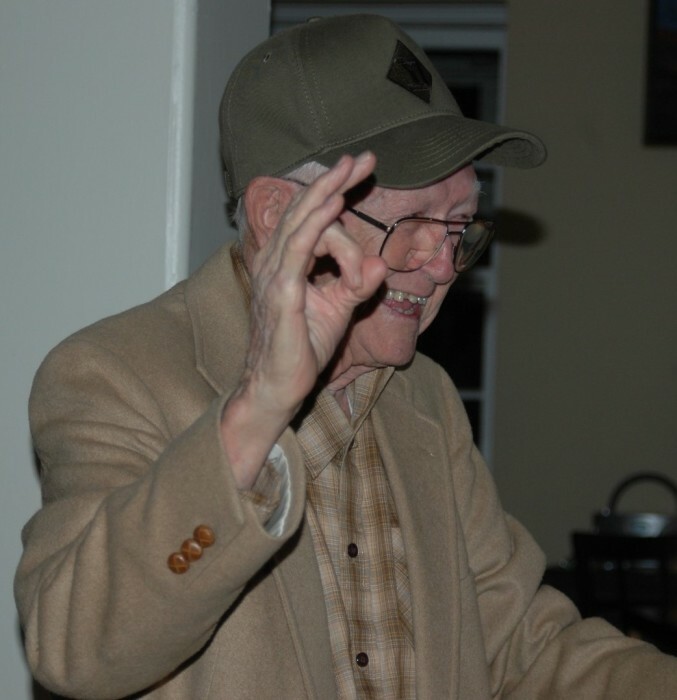 George honed his skills as cook on a Navy submarine in wartime and later running Murphy House and their “luncheons” were feasts to most people. They would eat, talk, fish all day and just enjoy their friendship. Dad even snagged “a big one” on a particular day when he caught George in the cheek with his hook during a cast! But mostly, he would bring home so many fish to fill the freezer, or just give away to the neighbors. In particular, he would call “Ms. Elisabeth” to come get fish which delighted them both… in the giving and the receiving. George and Dad’s fishing days were some of their very best days until Dad could no longer drive or go fishing – his buddy George visited him and they talked fishing until George’s sudden passing but it was another lifetime friendship. Woodworking gave him great pleasure and he always strived for excellence in every project. He would draw designs for a piece, then set out to create a “one of a kind” useful, practical item. He would create everyday things such as kitchen towel holders, napkin holders, fish scalers using wooden handles and bottlecaps, and wooden shelves to pass the time in his workshop. But his creativity and skill came to light with some of his more endearing and creative works for his children and grandchildren. He designed and built cradles for the birth of his grandchildren, built toys such as replica military jeeps and tanks and guns, handpainted in army green with great detail on each piece, and a dollhouse fit for a princess made for his granddaughter. But one of his most memorable pieces was the one he crafted that gained him a nickname that stuck with him for the remainder of his life. He designed and built a wooden riding rocking horse with yarn tail. He cleverly hid it in a back room with a long string tied to it running down the hallway to the Christmas tree. When young Justin followed the string down the hall and opened the door and saw it, he joyfully shouted out ‘HOSS” (he was still too young to pronounce horse) -- he climbed on it and started rocking away, repeating over and over again, “HOSS, HOSS, HOSS”… so from then on, he was no longer Grandpa – now he was the one and only “HOSS”… and he remained Hoss for the rest of his life to family and friends alike… the name just stuck. He built many other wonderfully practical items for his and others’ homes, but none seem to express him and his love of creating things to please others than those he created for his grandchildren. One of his most endearing traits was his love of telling jokes… during his working years, he would always come home with the jokes he had heard at the store or at the warehouse, and he had such a gift in re-telling them that always made them even more humorous than when he had first heard them. On one particular occasion two of his brothers came to visit him… they sat on the porch and the joke telling began. For several hours they bantered back and forth non-stop to see who could tell the most and the best jokes… it was hilarious as they tried to outdo each other. But in the end, Dad bested them -- both in number of jokes and best laughs… it was just another of his many gifts because he knew humor could always make any situation better. If you took a moment today to view the table with Dad’s military memories on it, you already know what a dedicated patriot he was and remained throughout his life. He always called himself “Lucky Jim” – because he cheated death on so many occasions – he had pneumonia twice as a child and the doctors twice said he would not pull through. He contracted malaria as a young child playing in a mosquito-laden river as a small boy in Smithfield. He saw his army brothers killed standing right next to him, and survived the horrors of war – when he first realized he had to kill another human being as he stared down a German soldier and knew it was “him or me” – a decision and memory that would stay with him his entire life. He survived his days as a German Prisoner of War. He survived so many situations that a lesser man never would have, and as he titled his memoir story, “I Lived to Tell About It”. Dad never considered himself a hero, but a patriot that did his job to defend his country, protect his family and protect the American lifestyle we all enjoy. His last few years suffering from the ravages of Alzheimer’s dementia took away so many of his memories of a life well lived. But he shared so many of his life experiences with others that we all know the hero he really was – especially to his wife, 3 daughters and the countless people he encountered along the way. He gathered lifelong friends like a bee gathers pollen… going from place to place, gathering the nectar of love and friendship and taking it back home to share with the hive – his family, his friends and his community. …when he took time to sit on the porch swing and gaze over the garden or watch the birds, horses and chickens while having “Miller Time” after a hard day he would often say “it just don’t get any better than this”… and he truly meant it. Funeral services will be held at 2 o’clock Saturday afternoon, February 2, 2019 in the Chapel of Bright Funeral Home. Entombment will follow in Pine Forest Memorial Gardens with full military honors and Masonic Graveside Rites. In lieu of flowers, memorial contributions may be made to the Masonic Home for Children, 600 College St., Oxford, NC 27565 or to Transitions LifeCare, 250 Hospice Circle, Raleigh, NC 27607.